The Pont National is a bridge over the River Seine originally called the Pont Napoleon III, and constructed during the Second Empire, it was originally designed as a service structure for a railway link and connects the 12th and 13th Arrondissements of Paris. After having been designed by the architects and engineers Couche and Petit, construction of this bridge in Paris first started in 1852 during the Second Empire, and when completed the following year, it was named the Pont Napoleon III. Originally this bridge was designed to go between fortifications, which were located in the 12th and 13th Arrondissements, and was designed as a service structure to carry the Petite Ceinture railway link. 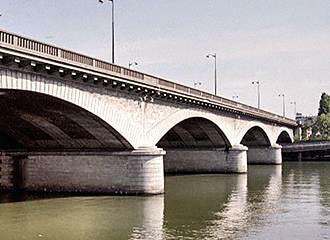 The name Pont Napoleon III was to remain until 1870 when it was changed to the Pont National, which is still the name of this bridge over the River Seine today, yet the original railway became disused and obsolete when the fortifications were removed and an interior ring road was created. However, the bridge was widened at the same time of the ring road being created, but in 1936 a decision was made to enlarge the bridge dramatically, which was designed by the engineers Netter and Gaspard. Yet this was not completed until the July of 1944, which then took the width of the bridge to 34 metres with a total length of just of 188 metres. Today you will find that there are five stone arches and three reinforced concrete arches that were added later and, as we mentioned earlier, since 1870 it has been called the Pont National. And the decision was taken to rename it the Pont National bridge after the military defeat of France against Prussia. 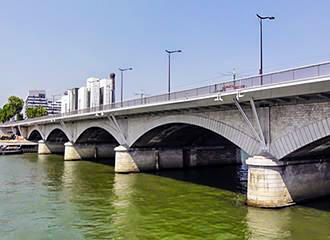 And in 2011 additional work was carried out on the Pont National bridge in order to allow for the T3a tramway line, so that cars, buses, the tram, cyclists and pedestrians could all be accommodated in a safe way of crossing over the River Seine at this point. 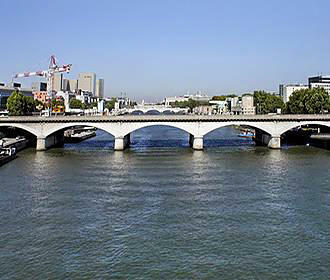 This bridge over the River Seine connects the Boulevard Poniatowski on the right bank in the 13th Arrondissement at the Quai Panhard et Levassor with the other side connecting to Boulevard Massena on the left bank of the river in the 12th Arrondissement at Quai de Bercy. And you will find the Pont National bridge located just inside the Peripherie with the Pont de Tolbiac being the next bridge downstream. When it comes to public transport in Paris, the nearest Metro stations are the Cour Saint-Emilion stop by the Bercy Village via line 14, or the Biblioteque Francois Mitterand Metro stop, alo on line 14, yet this is also an RER train station serving line C. However, the Pont National is also used for the Paris Tramway on line 3a and there is a tram stop on either side of the bridge.